The local art club had their annual spring show in June. They would only accept 2-D work that was framed or on gallery wrapped canvas. It had to have screw eyes and wire to hang the piece and be fairly small. I had words with a different art club in the area when they insisted that anything other than paintings on paper or canvas were NOT art but craft. Boy, just tell an artist that their medium isn’t art and you will be in for a fight. I straddled the fence for a long time before I decided that I would enter a couple of fiber pieces in the show. I would play by their rules and make certain the pieces I wanted to enter would hang like they asked. They would be entered in the mixed media category, I thought that was great that they had this category. Maybe they were coming into the 21st century! One of the pieces I felt would lend itself well to being mounted is one that has had two names: Dance and Feeding Frenzy. It began with a photo I took at the local boat dock. There are monster carps there that swarm when they feel the vibrations of feet on the plank. They want FOOD! The fiber piece has so many layers of complexity that I didn’t feel I could just mount it without doing something jazzy to really make it mixed media. The first thing I did is shown in the top photo. 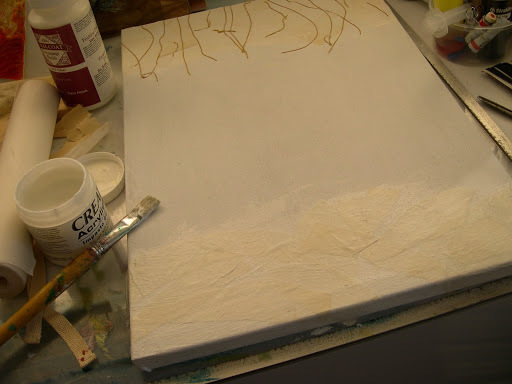 After stretching the canvas and gessoing it…I really did start from scratch and stretched raw canvas. I used to do that in school and it was fun to remember how. 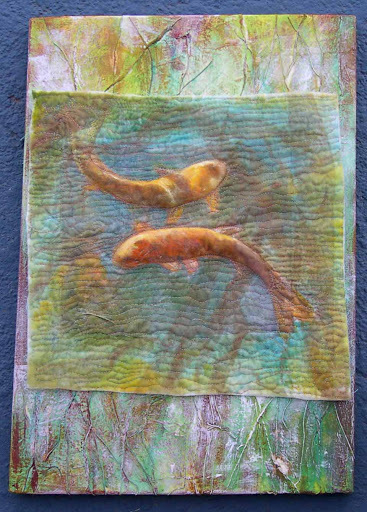 The next step was to use gel medium to apply torn pieces of rice paper for texture. Because I was going to make the background of the canvas look like water plants, I also applied heavy cording. When those layers were dry, it was time to paint. The trick was to make the canvas colors closely match the colors of textile paints that were overlaid with copper tulle on the fiber part. I wanted the finished piece to look as if it was always planned that way and the mounting wasn’t an afterthought. 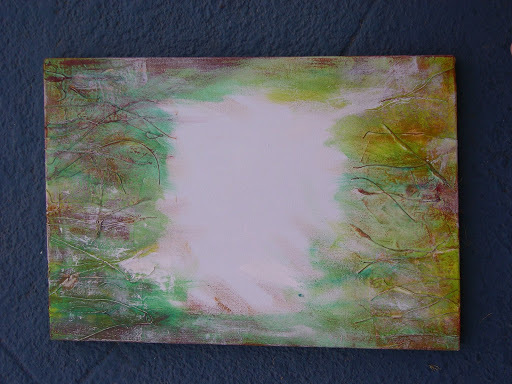 At first the colors on the canvas were too intense so I knocked them back with a light brushing of white. I was really pleased with the way this turned out. I thought I accomplished what I set out to do with this mounting. I showed up at the check in for artwork and paid my entry fees. They accepted the artwork since it was entered in mixed media. It all went against a wall in categories waiting to be hung. I was confused at that point since the only piece so far in the category was what looked like a gauche and ink. When we went to the reception, that gauche and ink got first place in mixed media, second was a collage with magazine pages and third was a watercolor and India ink. I wondered if I entered the WRONG category, but no, all those pieces were entered as mixed media. Maybe things have changed since I went to school but highlighting a painting with ink didn’t qualify as mixed media. With all the books, magazines and how-tos out there for mixed media I don’t understand how a qualified MFA judge could not know what was mixed media. Please don’t misunderstand, this isn’t sour grapes. I was thrilled that they at least accepted and hung this piece. It was totally outside the box for them. I have won ribbons at that show for acrylics and I knew it was a very, very traditional show. I think every time a fiber artist pushes the envelope in a traditional show it furthers the acceptance of the medium. But, I won’t enter this show again. I’ll save my money for a juried show. I have a solo show in February 2011. This piece is ready to go for the exhibition. There just might be an art buyer there who will fall in love with this and it might even be purchased. Wouldn’t that be great? A great peice. Thank you for helping to "tear down those walls" too. When I mention Art Quilt or Textile Art to many of the traditional artists that I meet, they often get the "glazed over" look in their eyes. Very few have ever heard of this art form before. I think it looks great. I like the way the canvas blends with the fiber piece. Good for you for sticking to your guns. It looks like a winner to me. Lovy, If you're doing really lovely and odd things, the best place is a sole artist show.Fitting in with others is overrated for artists. The point was to do and say something original. When people hang a group show, most of what they are trying to do, sometimes unconsciously, is to make things fit together.It tends towards a blandness, even in high end shows.Your work is lovely and unique. And I love those fish! Wow! I love those fish!